Sint Eustatius (Dutch pronunciation: [sɪnt øːˈstaːtsijʏs]), also known affectionately to the locals as Statia (/ˈsteɪʃə/), is an island in the Caribbean. It is a special municipality (officially “public body”) of the Netherlands. Map showing location of St. Eustatius relative to Saba and St. Martin. Map of Sint Eustatius from the Encyclopaedie van Nederlandsch West-Indië 1914-1917. The island has an area of 21 square kilometres (8.1 sq mi). In the 2001 census, the population was recorded as 3,543 inhabitants, with a population density of 169 inhabitants per square kilometre. As of 2015[update], the population was officially estimated at 3,877. The official language is Dutch, but English is the "language of everyday life" on the island and education is solely in English. A local English-based creole is also spoken informally. Travellers to the island by air arrive through F.D. Roosevelt Airport. 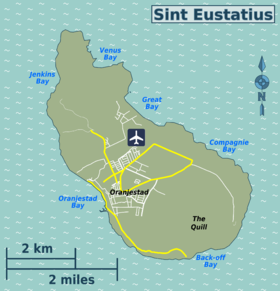 The name of the island, “Sint Eustatius”, is the Dutch name for Saint Eustace (also spelled Eustachius or Eustathius), a legendary Christian martyr, known in Spanish as San Eustaquio and in Portuguese as Santo Eustáquio or Santo Eustácio. The island was seen by Christopher Columbus in 1493 and claimed by many different nations. From the first European settlement, in the 17th century until the early 19th century, St. Eustatius changed hands twenty-one times. In 1636, the chamber of Zeeland of the Dutch West India Company took possession of the island that was then reported to be uninhabited. As of 1678, the islands of St. Eustatius, Sint Maarten and Saba fell under direct command of the Dutch West India Company, with a commander stationed on St. Eustatius to govern all three. At the time, the island was of some importance for the cultivation of tobacco and sugar. In the 18th century, St. Eustatius' geographical placement in the middle of Danish (Virgin Islands), British (Jamaica, St. Kitts, Barbados, Antigua), French (St. Domingue, Ste. Lucie, Martinique, Guadeloupe) and Spanish (Cuba, Santo Domingo, Puerto Rico) territories—its large harborage, neutrality and status from 1756 as a free port with no customs duties were all factors in it becoming a major point of transhipment of goods, and a locus for trade in contraband. Its economy developed by ignoring the monopolistic trade restrictions of the British, French and Spanish islands. St. Eustatius's economy, under the Dutch, flourished. The island became known as The Golden Rock. 17th-century Fort Oranje, with the island of Saba visible in the distance. It has no produce, no fortifications for its defense, nor martial spirit nor military regulations ... Its utility was its defense. The universality of its use, the neutrality of its nature was its security and its safeguard. Its proprietors had, in the spirit of commerce, made it an emporium for all the world. ... Its wealth was prodigious, arising from its industry and the nature of its commerce. The island sold arms and ammunition to anyone willing to pay. It was one of the few places from which the young United States could obtain military stores. The good relationship between St. Eustatius and the United States resulted in the noted "First Salute". On November 16, 1776, Captain Isaiah Robinson of the 14-gun American brig Andrew Doria, sailed into the anchorage below St. Eustatius' Fort Oranje. Robinson announced his arrival by firing a thirteen gun salute, one gun for each of the thirteen American colonies in rebellion against Britain. Governor Johannes de Graaff replied with an eleven-gun salute from the cannons of Fort Oranje. International protocol required a two gun less acknowledgment of a sovereign flag. The Andrew Doria flew the Continental Colors of the fledgling United States. It was the first international acknowledgment of American independence. [Note 1] The Andrew Doria had arrived to purchase munitions for the American Revolutionary forces. She was also carrying a copy of the Declaration of Independence which was presented to Governor De Graaff. An earlier copy had been captured on the way to Holland by the British. It was wrapped in documents that the British believed to be a strange cipher. In reality the documents were written in Yiddish, to Jewish merchants in Holland. "In commemoration to the salute to the flag of the United States, Fired in this fort November 16. 1776, By order of Johannes de Graaff, Governor of Saint Eustatius, In reply to a National Gun-Salute, Fired by the United States Brig of War Andrew Doria, Under Captain Isaiah Robinson of the Continental Navy, Here the sovereignty of the United States of America was first formally acknowledged to a national vessel by a foreign official. Presented by Franklin Delano Roosevelt, President of the United States of America"
The recognition provided the title for Barbara W. Tuchman's 1988 book The First Salute: A View of the American Revolution. The British took the incident seriously. Britain protested bitterly against the continuous trade between the United Colonies and St. Eustatius. In 1778, Lord Stormont claimed in Parliament that, "if Sint Eustatius had sunk into the sea three years before, the United Kingdom would already have dealt with George Washington". Nearly half of all American Revolutionary military supplies were obtained through St. Eustatius. Nearly all American communications to Europe first passed through the island. The trade between St. Eustatius and the United States was the main reason for the Fourth Anglo-Dutch War,1780-1784. For example, the British Admiral George Brydges Rodney, having occupied the island for Great Britain in 1781, urged the commander of the landing troops, Major-General Sir John Vaughan, to seize "Mr. Smith at the house of Jones - they (the Jews of St. Eustatius, Caribbean Antilles) cannot be too soon taken care of - they are notorious in the cause of America and France." The war was disastrous for the Dutch economy. The island of St. Eustatius taken by the English fleet in February 1781. Admiral Rodney's sailors and troops pillaged the island. Britain declared war on the Republic of the Seven United Netherlands on December 20, 1780. Even before officially declaring war, Britain had outfitted a massive battle fleet to take and destroy the weapons depot and vital commercial center that St. Eustatius had become. British Admiral George Brydges Rodney was appointed the commander of the battle fleet. February 3, 1781, the massive fleet of 15 ships of the line and numerous smaller ships transporting over 3,000 soldiers appeared before St. Eustatius prepared to invade. Governor De Graaff did not know about the declaration of war. Rodney offered De Graaff a bloodless surrender to his superior force. Rodney had over 1,000 cannon to De Graaff's one dozen cannon and a garrison of sixty men. De Graaff surrendered the island, but first he fired two rounds as a show of resistance in honor of Dutch Admiral Lodewijk van Bylandt, who commanded a ship of the Dutch Navy which was in the harbor. Ten months later, the island was conquered by the French, allies of the Dutch in the war. The Dutch regained control over the looted and plundered island in 1784. At its peak, St. Eustatius may have had a largely transient population of about 10,000 people. Most were engaged in commercial and maritime interests. A census list of 1790 gives a total population (free and enslaved people combined) of 8,124. Commerce revived after the British left. Many of the merchants (including the Jews) returned to the island. However, French and British occupations from 1795 disrupted trade and also the North-Americans, now globally recognised as an independent nation, had meanwhile developed their own trading network and did not need St. Eustatius anymore. The island was eclipsed by other Dutch ports, such as those on the islands of Curaçao and Sint Maarten. During the last years of the 18th century Statia developed trade in bay rum. The economy declined in the early 19th century. From about 1795, the population declined and in 1948 the population stood at a mere 921. The first record of Jews on St. Eustatius dates to 1660. The Jews were mainly merchants with significant international trading and maritime commercial ties. Jews were captains, owners or co-owners with Christian partners, of significant numbers of ships originating out of St. Eustatius. A few were island plantation owners. Jews were estimated[by whom?] to have comprised at least 10% of the permanent population of St. Eustatius. Ten days after the island surrendered to the British on 3 February 1781, Rodney ordered that the entire Jewish male adult population assemble for him. They were rounded up and thirty one heads of families were summarily deported to St. Kitts without word or mercy to their dependents. The choice of exiling the Jews to St. Kitts was significant. The nearby British Island of Nevis had a large Jewish population and an established community capable of aiding the refugees. St. Kitts did not have any Jewish community or population. The other seventy-one were locked up in the weighing house in Lower Town where they were held for three days. Expulsion of Americans followed on 23 February, of merchants from Amsterdam on 24 February and of other Dutch citizens and Frenchmen on 5 March. The crews of the Dutch ships Rodney took were sent to St. Kitts for imprisonment - after first stripping them of all their belongings. Because of their maltreatment, many perished. The Jews were well received on St. Kitts - where many knew them as their respected business partners. They were supported in their protest against their deportation and it proved successful. They were allowed to return to St. Eustatius after a few weeks to observe all their property being sold at small fractions of the original value after having been confiscated by Rodney. The resentment the British felt for the population of this island that helped the Americans to defeat them translated in a harsh treatment of the inhabitants. There were numerous complaints about "individuals of both sexes being halted in the streets and being body searched in a most scandalous way." The eighty-year-old member of the island council and captain of the civic guard, Pieter Runnels did not survive the rough treatment he received aboard Rodney's ship. He, a member of one of the island's oldest established families, became the only civilian casualty of the British occupation. British soldiers prevented the family and others paying their last respects at his funeral from using the water from the family's own cistern. The tomb of former governor Jan de Windt was broken open by British soldiers, all the silver decorations stolen off the caskets, and the bodies of the governor and his wife exposed - without any of Rodney's officers interfering. Rodney singled out the Jews: the harshness was reserved for them alone. He did not do the same to French, Dutch, Spanish or even the American merchants on the island. He permitted the French to leave with all their possessions. Rodney was concerned that his unprecedented behavior would be repeated upon British islands by French forces when events were different. However, Governor De Graaff was also deported. As he did with all other warehouses, Rodney confiscated the Jewish warehouses, looted Jewish personal possessions, even cutting the lining of their clothes to find money hidden in there. When Rodney realized that the Jews might be hiding additional treasure, he dug up the Jewish cemetery. From about 1815, when there was no longer a viable Jewish community using and maintaining the synagogue on St. Eustatius, it gradually fell into ruin. The synagogue building, known as Honen Dalim, (He who is charitable to the Poor) was constructed in 1737. Permission for building the synagogue came from the Dutch West India Company, additional funding came from the Jewish community on Curaçao. Permission was conditional on the fact that the Jewish house of worship would be sited where "the exercise of their (Jewish) religious duties would not molest those of the Gentiles". The building is located off a small lane called Synagogue Path, away from the main street. The synagogue attested to the wealth of the Jews of St. Eustatius and their influence on the island. In 2001 its walls were restored as part of the Historic Core Restoration Project. Unfortunately no known images exist showing what the synagogue looked like when it was still in use, and therefore archeological research is attempting to restore the structure to the best estimate of its former condition. The grounds include a Jewish ritual bath (a mikveh) and an oven used on Passover. A restored and respectfully maintained Jewish cemetery is located adjacent to the Old Church Cemetery, at the top of Oranjestad, Sint Eustatius. The wealth Rodney and General Vaughan discovered on St. Eustatius exceeded their expectations. There were 130 merchantmen in the bay as well as the Dutch frigate and five smaller American armed merchantmen. In total the value of goods seized, including a very rich Dutch convoy captured off Sombrero, was estimated to be well in excess of £3 million. On 5 February 1781 Rodney and Vaughan signed an agreement stating that all goods taken belonged to the Crown. Rodney and Vaughan, by British custom, expected to personally receive a significant share of the captured wealth from the King once it reached England. Instead of delegating the task of sorting through and estimating the value of the confiscated property Rodney and Vaughan oversaw this themselves. They delayed their departure. Rodney, privately, wrote to his family with promises of a new London home. To his daughter he promised “the best harpsichord money can purchase”. He confidently wrote of a marriage settlement for one of his sons and a soon-to-be-purchased commission in the foot guards for another son. He wrote of a dowry for his daughter to marry the Earl of Oxford. He noted he would have enough to pay off the young prospective bridegroom’s debts. The excessive amount of time Rodney spent on St. Eustatius led to allegations that Rodney and Vaughan had neglected their military duties. In particular, Viscount Samuel Hood suggested that Rodney should have sailed to intercept a French fleet under François Joseph Paul de Grasse, traveling to Martinique. The French fleet instead turned north and headed for the Chesapeake Bay. Rodney's delay at St. Eustatius was not the first time he had taken the opportunity to capture prizes over the immediate and expeditious fulfillment of his military duties. During the Seven Years' War of 1756-1763, Rodney had delayed transporting Major General Jeffrey Amherst in order to pursue prizes. Later, Rodney had been ordered to Barbados to link up with Admiral Sir George Peacock and the Earl of Albemarle for an attack on Cuba. Instead, Rodney sent valuable ships off in search of prizes. In 1762, after the fall of Martinique, Rodney quarreled with the army over prize-money. During Rodney's command in Jamaica (1771-1774) the Earl of Sandwich feared that Rodney might provoke a war with Spain to obtain prize money. Rodney further weakened his fleet earlier by sending a strong defending force to England to accompany his treasure ships. After months on St. Eustatius, capturing additional merchants and treasure, Rodney was prevailed upon to send part of his fleet north to aid General Cornwallis and British armed forces fighting the Americans. He did not dispatch the bulk of his fleet from St. Eustatius until July/August 1781. The ships arrived too late to affect the events that were taking place in North America. Outside of the Chesapeake Bay, a much stronger combined French fleet under Rear Admiral Francois Joseph Paul, the Comte de Grasse defeated the weakened British fleet (5 September 1781). The battle between de Grasse and Rear Admiral Sir Thomas Graves became known as the Battle of the Chesapeake. Also known as the Battle of the Capes it was one of the most pivotal battles in history. British General Cornwallis, trapped at Yorktown, Virginia, desperately awaited much-needed supplies and men that Rodney would have brought. American General George Washington, with French siege-artillery and supporting forces, closed the vise from the land side. Cornwallis could not be aided from the sea because of the British naval defeat. The French controlled the Bay. Cornwallis' predicament linked directly to Rodney's failure to depart St. Eustatius promptly following its capture and the destruction of the military stores there. Cornwallis had no choice. He surrendered (19 October 1781). The American Revolutionary war was over. The Americans had won, partially due to Rodney's anti-Semitic and avaricious delays. A series of disastrous French and British occupations of Sint Eustatius from 1795 to 1815 diverted trade to the occupiers' islands. St. Eustatius' economy collapsed. The Jews left along with the other merchants. St. Eustatius reverted permanently to Dutch control afterwards. Sint Eustatius became a member of the Netherlands Antilles when that grouping originated in 1954. Unlike the other member islands, the people of St Eustatius did not vote to leave. In a referendum on 8 April 2005, 77% of voters voted to remain within the Netherlands Antilles, compared to 21% who voted for closer ties with the Netherlands. However, once the other islands decided to leave, meaning that the Netherlands Antilles would become defunct, the island council opted to become a special municipality of the Netherlands, like Saba and Bonaire. This process was completed in 2010. Sint Eustatius photographed from the ISS. View looking southeast along the Atlantic coast, showing the airport runway in the middle distance, Lynch Beach beyond that, then the Quill, St. Eustatius' dormant volcano, and over the water in the distance, the northern end of the island of St. Kitts. 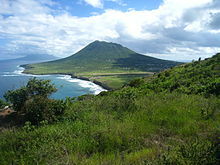 Topographically, the island is saddle-shaped, with the 602 meter-high dormant volcano Quill, (from Dutch kuil, meaning 'pit'—originally referring to its crater) to the southeast and the smaller pair Signal Hill/Little Mountain (or Bergje) and Boven Mountain to the northwest. The Quill crater is a popular tourist attraction on the island. The bulk of the island's population lives in the saddle between the two elevated areas, which forms the center of the island. The national parks of St. Eustatius, which comprise the Quill/Boven park, the Botanical Garden, and the Marine Park, are all under the control of the non-profit foundation STENAPA. Due to the fact that St.Eustatius is a volcanic island and its size is so small, all of the beaches on the island are made up of black sand/ volcanic sand. These volcanic sands, especially one of the more popular nesting beaches called Zeelandia, are very important because they serve as a nesting site for several endangered sea turtles such as: the green turtle, leatherback, loggerhead and hawksbill. Sint Eustatius has two national parks: The Sint Eustatius Marine National Park and the Quill/Boven National Park on land. Both are maintained by Sint Eustatius National Parks Foundation (STENAPA). 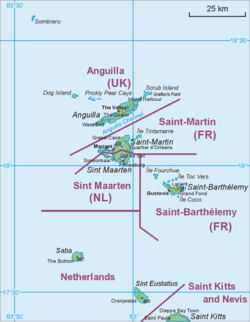 Sint Eustatius is predominantly Protestant with a Catholic minority (25%). In the 18th century, "Statia" was the most important Dutch island in the Caribbean and was a center of great wealth from trading. At this time it was known as the "Golden Rock" because of its immense wealth. A very large number of warehouses lined the road that runs along Oranje Bay; most (but not all) of these warehouses are now ruined and some of the ruins are partially underwater. A French occupation in 1795 was the beginning of the end of great prosperity for Sint Eustatius. According to the Sint Eustatius government website, "Statia's economy is stable and well placed to grow in the near future. With practically no unemployment and a skilled workforce, we have a infrastructure in place to ensure sustained growth." The government itself is the largest employer on the island, and the oil terminal owned by "NuStar Energy" is the largest private employer on the island. The solar park on Sint Eustatius in 2016. Statia Utility Company N.V. provides electricity to the island, as well as drinking water per truck and on part of the island by a water network. The electricity supply is rapidly being made green. Until 2016 all electricity was produced by diesel generators. In March 2016 the first phase of the solar park with 1.89 MWp capacity became operational, covering 23% of entire electricity demand. In November 2017 another 2.15 MWp was added, totaling 14,345 solar panels, with 4.1 MW capacity and a yearly production of 6.4 GWh. The solar park includes lithium ion batteries of 5.9 MWh size. These provide power for grid stability, as well as energy shifting. On a sunny day the diesel generators are switched off from 9 a.m. to 8 p.m. This is made possible by grid forming inverters produced by SMA. This is one of the first such solar parks in the world, and provides 40% to 50% of the island's electricity. Dutch government policy towards St. Eustatius and other SSS islands promoted English medium education. Sint Eustatius has bilingual English-Dutch education. Gwendoline van Putten School (GVP) is a secondary school on the island. Other schools include: Golden Rock School, Gov. de Graaff School, Methodist School, SDA School. The most popular sports on Sint Eustatius are football, futsal, softball, basketball, swimming and volleyball. Due to the small population, there are few sport associations. One of them, the Sint Eustatius Volleyball Association, is a member of ECVA and NORCECA. Currently St. Eustatius is a non-active member of the Caribbean zone of Pony Baseball and Softball leagues. ^ .bq is designated, but not in use, for the Caribbean Netherlands. Like the rest of the Netherlands, .nl is primarily in use. ^ The first salute to the Colors may have occurred one month earlier. It is debatable if a Colonial merchantman received a formal salute from Fort Frederik on the Danish island of St Croix (The birth of our Flag page 13 published 1921) and (Americas Library) Translated from the Danish Wikipedia article on Frederiksted "Frederiksted is a town on St Croix in the U.S. Virgin Islands which were previously the Danish West Indies. .. The town is dominated by the red and white Fort Frederik from the 1750s. The fort has special meaning to both USA and Denmark-Norway. It was from here that the first foreign salute of recognition of USA independence was given in 1776." ^ "Bevolkingsontwikkeling Caribisch Nederland; geboorte, sterfte, migratie" (in Dutch). CBS Statline, Statistics Netherlands. 2013. Retrieved 2015-03-07. ^ "BQ - Bonaire, Sint Eustatius and Saba". ISO. Archived from the original on 17 June 2016. Retrieved 29 August 2014. ^ "Delegation Record for .BQ". IANA. 20 December 2010. Archived from the original on 30 July 2012. Retrieved 30 December 2010. ^ Mangold, Max. Duden – Das Aussprachewörterbuch. In: Der Duden in zwölf Bänden, Band 6. 7. Auflage. Berlin: Dudenverlag; Mannheim : Institut für Deutsche Sprache, 2015, Seite 786. ^ a b c d e Tuchman, Barbara W. The First Salute: A View of the American Revolution New York: Ballantine Books, 1988. ^ "Wet openbare lichamen Bonaire, Sint Eustatius en Saba (Law on the public bodies of Bonaire, Sint Eustatius and Saba)". Dutch Government (in Dutch). Retrieved 14 October 2010. ^ English to be sole language of instruction in St Eustatian schools. Government of the Netherlands. 19 June 2014. Retrieved 20 February 2015. ^ "Antillen opgeheven". NOS Nieuws. 2009-11-18. Archived from the original on 2009-12-24. Retrieved 2010-10-10. ^ "The American Revolution". Ouramericanrevolution.org. Retrieved 22 December 2018. ^ "Battle of the Capes - Yorktown Battlefield Part of Colonial National Historical Park (U.S. National Park Service)". Nps.gov. Retrieved 25 August 2017. ^ "Stenapa". Statiapark.org. Retrieved 2010-10-10. ^ a b "Religion in Caribbean Netherlands". Centraal Bureau voor de Statistiek. ^ "Economy," statiagovernment.com, accessed 15 December 2012. ^ "Economy," Archived 2014-10-06 at the Wayback Machine rijksdienstcn.com, accessed 22 April 2014. ^ Dijkhoff, Marta, Silvia Kowenberg, and Paul Tjon Sie Fat. Chapter 215 "The Dutch-speaking Caribbean Die niederländischsprachige Karibik." In: Sociolinguistics / Soziolinguistik. Walter de Gruyter, January 1, 2006. ISBN 3110199874, 9783110199871. Start: p. 2105. CITED: p. 2108. ^ "Directory." Sint Eustatius Government. Retrieved on February 28, 2018. ^ Stokkermans, Karel. "Sint Eustatius - Football History". Rec.Sport.Soccer Statistics Foundation. RSSSF.com. Retrieved 29 June 2012. ^ "Cruyff Courts Sint Eustatius/Saba/Sint Maarten". Windward Roads B.V. 1 January 2007. ^ "1st Cruyff Court Dutch Caribbean Futsal Championship 2007 (Aruba)". RSSSF. 6 February 2008. ^ "Saba and St. Eustatius compete in softball". Pearl FM Radio – Pearl of the Caribbean. 27 June 2011. Jedidiah Morse (1797). "St. Eustatius". The American Gazetteer. Boston, Massachusetts: At the presses of S. Hall, and Thomas & Andrews. Wikimedia Commons has media related to Sint Eustatius. 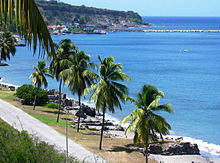 Wikivoyage has a travel guide for Sint Eustatius.